When I was 13 or 14 I volunteered for my first political campaign. My friend Brooke’s dad, Tom Kelly, was running for Governor as an independent. He was on a ticket with Kodiak’s Kay Pohland. I didn’t do much. My only real memory was going door to door in a trailer park. I’m not sure why anyone thought that was a good spot to door knock—it wasn’t. 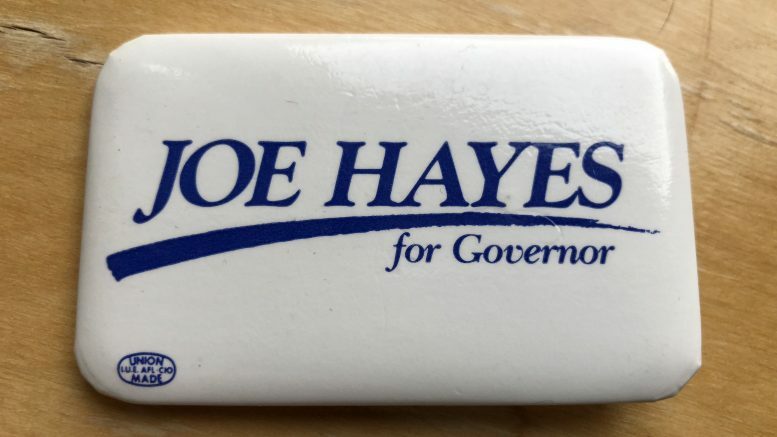 After graduating high school a few years later, not quite 18 yet, I volunteered for Joe Hayes’ mayoral campaign. When not working at the Book Cache, I spent my free time stickering direct mail and helping on all aspects of the campaign. It was the summer before leaving for college out of state. In retrospect, it was a strange choice as a transition from childhood to adulthood—but it was life changing in many ways. Bill McConkey was the campaign manager. He largely ignored me except when my high school girlfriends would pop by. Frank Bickford was the cool older guy with stories, drinks and a cool old Mercedes we rode around in delivering yard signs and fundraiser setups. Lisa Murkowski, the deputy campaign manager, would get promoted to campaign manager when McConkey made the news for saying he would lie to get his candidate elected. Joe Hayes, a thoughtful, decent person took too long to call for McConkey’s scalp, and the campaign lost momentum and failed. Joe and Tony owned a business together. I think it was Grizzly Burger or the Works; maybe both. Doesn’t matter. But they met to go over business while they were competing to become mayor. Joe told me that Tony was a good guy—but too liberal. He literally couldn’t think of anything negative to say and wasn’t inclined to do so. When I graduated college four years later, Joe was running for governor. I was the last person hired to be on the team. You always remember the first person to give you your first “real” job. Gone were McConkey and Murkowski and Bickford. The new team was Art Hackney, Jeff Day, Virginia Breeze, Mark Hanley, Mark Stephenson, Terry Strle and me. I was stashed in Ketchikan, given the least prospective place in the state to catch fire. It never did. When candidate Joe Hayes visited Southeast, I travelled with him. I learned he loved oysters. That his wife Diane was the most precious thing in his life. He had attended high school with my dad. I didn’t know that until he upbraided me once for complaining about him. “Your dad is not the bad guy you think he is,” he barked at me once. I calculated that he was sensitive about the basis of my criticism; he too was a divorced dad who probably was not the most involved parent. Maybe not. But I thought if Joe was telling me to cut him a break, I would reflect on whether I was being unfair. Joe Hayes didn’t win that race either. If you asked him what time it was, he would tell you how to build a watch. When a camera was pointed at him, he would look away. In person he exuded decency and integrity, on camera he looked to be dissembling. He was the best guy to run and never be governor. I’ve measured every candidate I’ve worked with against him, and they all feel inferior to me. He was like your favorite Jimmy Stewart role come alive. To say he was a father figure is too strong, but he was a role model nonetheless. I admired his business accomplishments. I was charmed and critical of some of the folks who would try to attach themselves to him. He was just too nice sometimes. All the time. The last time I saw him, he and Diane has wandered into Middle Way Cafe looking for lunch. They were patiently waiting for a waiter (there are none. You order at the counter). I went over to them and took them to Beartooth so they could sit and be waited on. It was clear they were slowing down, but they held hands during lunch and I was glad to visit with both of them. Diane preceded Joe in death. She attended school with my dad too. Diane was clearly half of team Joe Hayes. The protective half. I can’t reflect on him without thinking of her. The Legislature recently named rooms for Jan Faiks, Al Adams and Max Gruenberg. If left to me, the capitol building itself would become the Joe L. Hayes building. 3 Comments on "TMS Editorial: Remembering Speaker Joe Hayes"
Thank you so much for this lovely tribute to my cousin Joe. He deserved to be remembered for his accomplishments and the things he did for Alaska with a modest heart. Jim – I just happened upon this accurate remembrance of Joe Hayes. I always looked forward to talking with him and hearing his opinions. The underlying decency of the man has never left me over the ensuing years. Nicely done.